Heavy metal veterans Iron Maiden are making their film debut in a new feature length documentary following them on tour. Titled Flight 666, the filmmakers get inside Maiden's converted Boeing 757 which flies them between gigs. The plane, called Ed Force One, is flown by singer Bruce Dickinson, who is also a qualified commercial pilot. 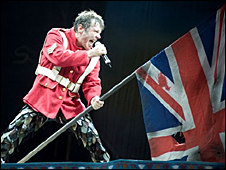 Iron Maiden say the film, set for release on 21 April, gives unprecedented access to the band. They regard their Somewhere Back In Time World Tour, in February and March of 2008, as one of their most ambitious. They played 23 sold-out stadium and arena shows in 45 days, travelling nearly 44,000 miles and performing to almost half a million fans in 13 countries. Their customised plane carried the crew and 12 tons of music and stage equipment. The band were followed by an award-winning documentary team from Canada, behind films like Metal: A Headbanger's Journey and Global Metal. There has been a spate of metal documentaries in recent years, starting with Metallica's Some Kind of Monster in 2004 to last year's The Story of Anvil. Iron Maiden have also been nominated for a best live act at this year's Brit Awards, to be held at London's Earls Court on 18 February.